In subterranean bunkers at the All England Club, statisticians are churning out millions of data nuggets during the Wimbledon championships, gobbled up by tennis nerds, players—and, increasingly, everyday fans. Every single shot at the tournament is logged by US technology giants IBM, capturing 4.8 million bits of information—more statistics than they know what to do with. But they are coming up with new ways of using the information to help obsessive tennis geeks and passing Wimbledon watchers alike to understand what's really going on inside a match. "We are trying to explain why a match is evolving the way it is. Statistics help bring it to life," said Simon Boyden, who is in charge of IBM's tech installations at the All England Club. One new innovation this year is a momentum graph, showing how the balance of power shifts during the match—and statistically what lays behind it. Even if players are behind, things might be swinging in their favour, such as improved service accuracy. IBM are also now producing artificial intelligence-generated video clips, based on formulas which determine the most exciting moments during a match. "Previously, we had video editors to make highlights. We asked, could we get a computer to do the same thing?" said Boyden. "There is definitely an art and a science to it," Boyden told AFP. 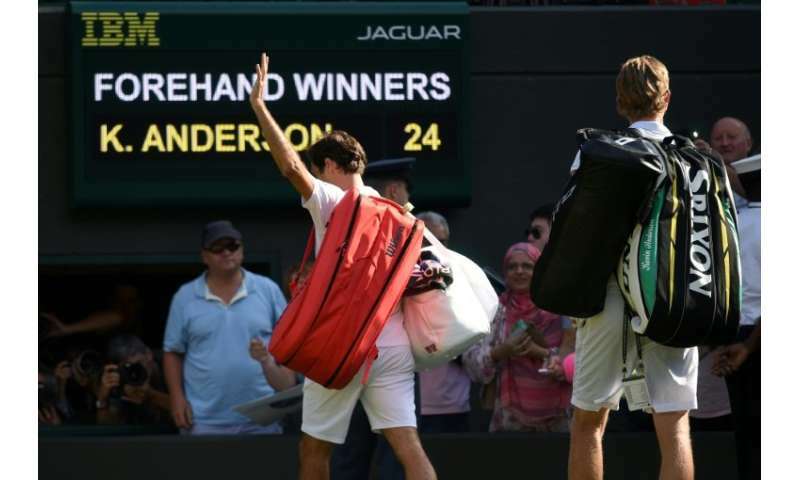 The highlights are used on the Wimbledon website and its YouTube channel, among other outlets. Last year, clips of Roger Federer winning his eighth title did not top the popularity charts: that honour went to Nadal accidentally banging his head on a door frame. IBM has been the championships' official information technology provider since 1990. So far more than 54 million bits of Wimbledon data are in the system. For all its tech whizz, the point-by-point data input—including where serves landed, rally length—relies on 48 statisticians sat courtside: regional-level tennis players highly trained in using the interfaces. "We want to be able to capture all of the data about the points in a sub-second time and 100 percent accuracy," said Boyden. "All of the smart stuff that we do around artificial intelligence and analytics doesn't work unless you've got the quality data to start with. "Players understand the game, such as the difference between forced and unforced errors," he explained. "Tennis players are still better at working out statistics—at the moment." This year Wimbledon is debuting a chatbot on Facebook messenger, with users able to get updates on their favourite players, consult scores and ask questions such as where they can buy strawberries around the grounds. It already has 4.4 million users. Wimbledon was reticent about introducing free wifi around the courts, fearing people would fiddle with their phones rather than watch tennis. But a usage analysis experiment on Court 12 found that during play, people did actually stop using their phones and watched the matches. In tennis's amateur era, it might have been considered courteous for men to serve with less ferocity to women in the mixed doubles. Stats analysts were able to prove that, consciously or not, it still goes on in the professional game: in 2017, men did indeed serve four or five miles per hour slower to women. They also provide answers to all manner of obscure commentator enquiries, including matches between men with unisex given names, how well Federer does on Tuesdays, or, as England prepared to face Croatia in the World Cup semi-finals, how English players have done against Croats in Wimbledon semis. "Every year, there's a wealth of things we didn't dream people could think of," said broadcast liaison officer Keith Sohl.